In the United States vehicular accidents will occur more than 5.5 million times this year, causing over 2 million injuries and more than 31 thousand deaths. They are the leading cause of death for teenagers and children, and the main cause of Post-Traumatic Stress Syndrome (PTSD) in our civilian population. Driving is the most dangerous activity most people engage in and most of us who drive will eventually get into some type of traffic accident. It helps if we’re conscious, aware drivers but even the most conscientious and cautious drivers aren’t immune. Car Accidents Happen: What You Can Do If It Happens to You is a thoroughly fact checked and researched guide to successfully dealing with the circumstances created by being in an accident, and includes forms and recommendations for ‘Crash Kits’ that you can keep in your car so you’ll be well prepared if it happens to you. It could save your or a loved one’s life. Now, buying a new car, truck or van can be easier than ever, without the guesswork or the stress of haggling with a dealer. 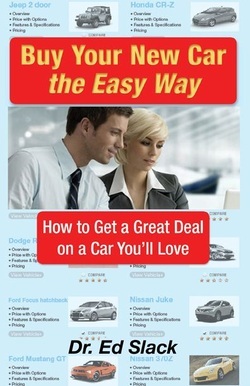 Buy Your New Car the Easy Way: How to Get a Great Deal on a Car You'll Love will save you time, monet and headaches, guaranteed. If You don't save at least $1000.00 using Buy Your New Car the Easy Way: How to Get a Great Deal on a Car You'll Love, return it within 30 days for a full refund, (print version only). "I saved over seven thousand dollars from the first offer I got and the salesman told me I couldn't find a better price anywhere. Thanks Doc! I love my new car and your method made getting a great deal easy". Print Version - Secure Google Link - $19.95 - Free Shipping! Print Version - Secure PayPal Link - $19.95 - Free Shipping! 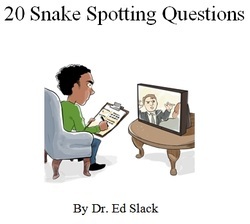 20 Questions to Help You Spot Two Legged Snakes! We painstakingly devised this rating scale to help you spot Two Legged Snakes, (untrustworthy people), so you'll know whose trust-able and whose not. Simply rate the 'person in questions' traits and add up their score. This easy to use rating scale is an endless resource because you can make copies and use it again and again and again. $2.99 + $1.45 Shipping and Handling. Overseas orders: $3.45 Shipping & Handling. (No returns).